MERIDA, Mexico – Is the ancient Maya doomsday prophecy accurate? Will the world come to an end on Dec. 21, 2012 as predicted by the ancient astronomers and used as the theme of the movie, 2012? “Not so!” says Jorge Ruz, son of famous Mexican Maya archaeologist Alberto Ruz Lhuillier and co-owner of Hacienda Xcanatun, a restored 18th-century, sisal hacienda on the outskirts of Merida, Yucatán. Whether the doomsday prediction is real or not, a favorite Mexican saying, loosely translated advises should the world come to an end, come to Merida, implying that nothing bad will ever happen in Merida. To help guests delve more deeply into the authentic history and culture of the ancient and modern Maya, Jorge and his wife Cristina Baker are adding three new, day trips to complement their existing list of tour options. Excursions are via a private air-conditioned car (van for families), led by highly trained, bilingual guides. A full day tour ranges from $120 – $250. Yucatan. Today, Mayapan’s ceremonial center is small and its massive central pyramid in ruins, yet, at its peak the population was close to 10,000 with 3,600 structures. Jungle paths lead from the center to small temples including a circular tower called El Caracol. 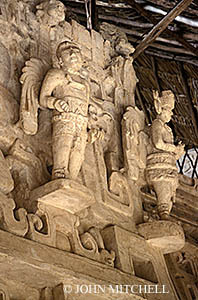 A small central temple has a fine high-relief mask of the Mayan rain god, Chaac. • Horseback Riding, Kayaking & Birding in an Untouched Coastal Biosphere + Visit Ancient Salt Mines a rare encounter with pristine nature and Maya history. After horseback riding across a private ranch, visitors paddle leisurely through canals in the Ria Lagartos Biosphere, home to snowy and red egrets, great white herons, white ibis and a spectacular flamingo colony. Visit Las Coloradas and explore giant, coastal salt mines. The mines produced the finest White Sea salt, a highly prized trading commodity coveted by Maya royalty, and traded as far away as central Mexico. • Indigenous Tourism Supports Traditional Maya Lifestyle and offers a look at the continuum between ancient and modern Maya. 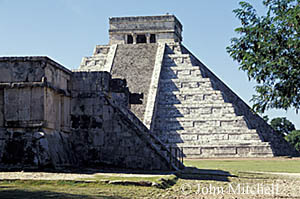 The villages of Ek Balam and Yaxunah, both close to Chichen Itza, are using tourism to provide jobs locally. Each day a limited number of visitors are welcomed to take part in normal village life. Accompanied by a local guide, guests hike and bird around unexcavated Maya ruins and prepare lunch with the villagers in the traditional open-pit oven. Afterward there is time for a visit to the grand ceremonial city, Chichen Itza, or a swim in the local freshwater village cenote (deepwater sinkhole or cavern). Returning in the evening, a dip in the pool and a soothing spa treatment prepare adventurers for the sophisticated cuisine and fine wines served at Xcanatun’s gourmet restaurant. Nightly rates at Hacienda Xcanatun range from $260 – $340, single or double occupancy, depending on the room category and season. Additional tour options include visits to the ceremonial centers at Uxmal or Ek Balam; an exploration of the Spanish Colonial Convent Trail; plus culinary and artistic experiences. Golfers4-night Special priced at $1950 for two people includes: two rounds of golf on Jack Nicklaus’ private El Jaguar course, transfers, cart and fore caddy; one dinner with wine and a spa treatment each.. The unique course layout winds around fragments from neighboring Dzibilchaltun, an important Maya site. For more information about Hacienda Xcanatun, the excursion program or events in the Yucatan e-mail hacienda@xcanatun.com, or call toll-free 1-888-883-3633. The website is at www.xcanatun.com.